HammondCare has developed a project aimed at delivering quality End of Life Care initiatives in Residential Aged Care Facilities (RACF) in northern Sydney. This program, commissioned by Sydney North Health Network (SNHN), aims to foster partnerships between aged care, general practice and HammondCare’s Specialist Palliative Care services. Participating RACFs will receive ongoing advice, support and training in palliative care, facilitating a network of linkages. The focus is on building a sustainable, end of life capability in each RACF. Through an Expression of Interest, 24 RACFs were selected to be a part of this program, commencing in August 2017 and running through to July 2018. If you are a GP linked to one of the participating RACFs, HammondCare are keen to work closely with you to increase knowledge and capability on palliative care. One of the key outcomes being to avoid unplanned hospital admissions. To do so, please contact Nurse Manager, Kelly Arthurs on 0434 309 724. 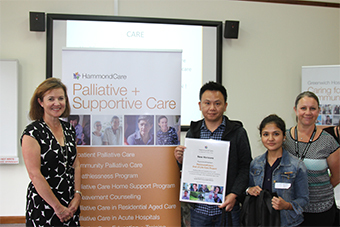 Early next year HammondCare will be hosting an education event for GPs with guest speakers on palliative care, and throughout the year, smaller online educational events on related key topics. Dates for these events will be circulated in early January 2018.